Democrat Mark Stone currently represents Assembly District 29 and will not be termed out until 2024. Stone is expected to easily win re-election in 2016. 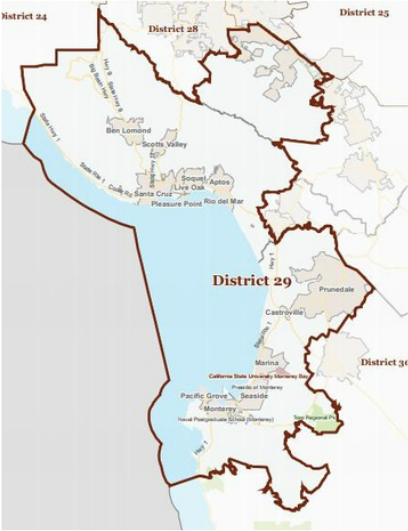 Mark Stone represents the people of California's 29th Assembly District, which includes portions of Santa Cruz, Santa Clara, and Monterey Counties. Although he is serving his first term as a state legislator, Mark has emerged as a leader on environmental protection and child welfare issues. As an environmental champion, Mark has fought to curb illegal coastal development, reduce plastic pollution, and clean up drinking water supplies. In his capacity as Chair of the Select Committee on Coastal Protection, he has held hearings investigating threats to the Pacific Ocean, oil spill prevention efforts, and plastic garbage effects on the coastal environment. As Chair of the Assembly Committee on Human Services, Mark leads policy decisions on child welfare, foster care, developmental disability services, temporary cash assistance, and CalFresh food benefits. In 2013, Mark wrote a package of laws that will help make it easier for foster youth graduate from high school and access special benefits. He also held several key oversight hearings to discuss ways to address childhood poverty and improve information sharing in the foster care system. Before his service in the Assembly, Mark represented the Central Coast in various capacities. He was elected twice to the Santa Cruz County Board of Supervisors, where he worked on health care, education, youth issues and the environment. While there, he held leadership roles on the Santa Cruz County Regional Transportation Commission, the First 5 Commission, and the Santa Cruz City/County Library Joint Powers Board. Additionally, Mark led an overhaul of the Santa Cruz County child welfare system. He was an outspoken supporter of the Queer Youth Task Force and fought to halt discrimination of LGBT youth. As an environmental defender at the local level, he spearheaded the successful effort to ban single-use plastic bags. In addition to his duties as a County Supervisor, Mark served the entire coast as Vice Chair of the California Coastal Commission. During his time on the Commission, he earned the reputation as a principled leader who protected the cherished California coastline for generations to come. Prior to his work at the County, Mark was a trustee of the Scotts Valley Unified School District, eventually being elected President. Before entering public service, Mark worked as an attorney in the tech industry and as a professor at the Naval Postgraduate School. Mark lives in Scotts Valley with his wife Kathy. They have two adult children. Stone is an avid open water swimmer.